As it was on all hosts, the indication was that the error or misconfiguration is not in the ESXi hosts but probably at the storage layer. 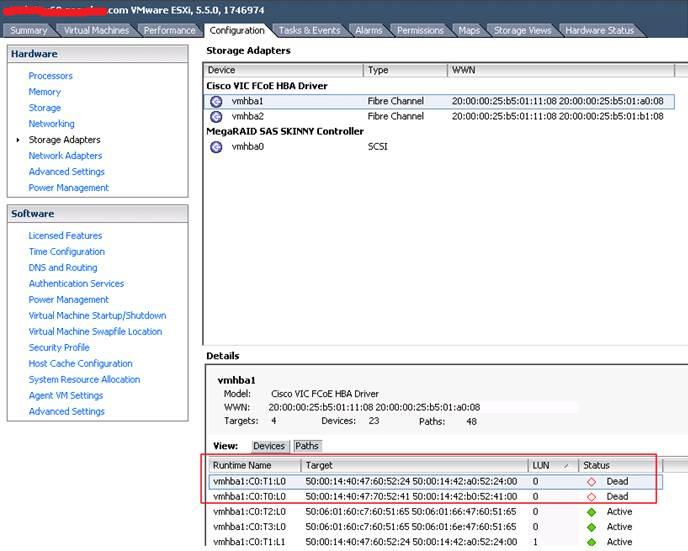 The ESXi boot LUN has id 0 and is provisioned directly via VNX. The LUNs for virtual machines are provisioned via the VPLEX and their id's starts from 1. However, ESXi still expects a LUN with id 0 from the VPLEX. If not, the above error will show. To fix the issue, present a small "dummy" LUN to all the hosts via the VPLEX with LUN id 0. It can be a thin provisioned 100 MB LUN. Rescan the hosts. But don't add the datastore to the hosts, just leave it presented to the hosts but not visible/usable in vCenter. This will make the error go away. When storage later has to be added, the dummy LUN will show as an available 100 MB LUN and likely operations guys will know not to add this particular LUN. Note. Don’t create datastore on the lun. According to VCE, adding this LUN 0 is not supported with UIM(P (provisioning tool for Vblock). We started seeing issues with the re-adapt function for UIM/P and storage issues after that. So we had to remove the LUN 0. So far, there is no fix if using UIM/P.